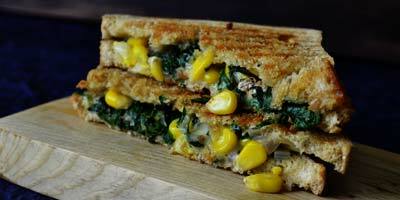 How to make Spinach Corn Grilled Sandwich Cheesy Recipe is all time favorite snack. Caffe Coffee Day Spinach Corn Sandwich with Espresso coffee goes perfect. In a non-stick pan, add oil and butter. Once it is melted, add chopped garlic. Sauté for a minute or till the raw smell of garlic goes away. Add chopped onion, fry it for few minutes and then add chopped tomatoes. Saute it for few minutes and then sprinkle some salt in it and mix. Add spinach and sauté for a minute. Add corn kernels, mix it well and sauté for 2-3 minutes. Transfer the mixture into a bowl, add cheese and mayonnaise and mix well. 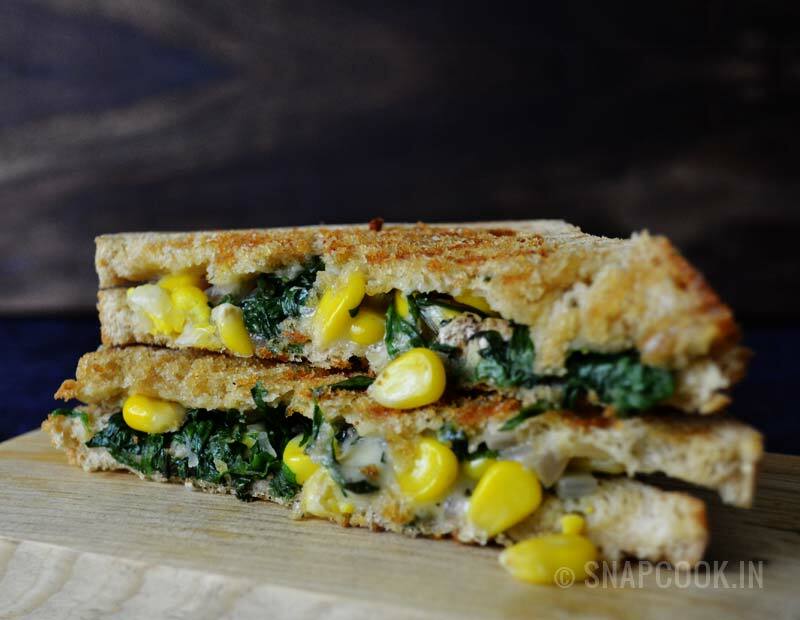 Apply butter on bread slices and spread spinach corn mixture on the buttered bread evenly. Cover it with another bread slice and brush some butter on top. Put the buttered side of bread slice in sandwich griller and apply butter again on top. Close the griller and let it grill for 5-6 minute or till golden brown.